Here at our BaseRails office, we have a hand-drawn infographic (courtesy of Alex’s calligraphy hobby) of a Pain Measurement Scale. Like the ones you see in hospitals for sick patients, our scale lets you tell us how much pain you’re in. Instead of measuring physical sickness, we measure the pain of getting your startup idea off the ground. We’ve been hearing the same story over and over again. An aspiring entrepreneur starts out with an idea. It’s very precious to him (in a Gollum-y preciousssss kind of way). The first place he goes to build it is WordPress. Choose a theme, add some text, and it’s live! But if he wants anything outside the scope of a blog or a template, WordPress doesn’t cut it. There’s a steep drop off here and many ideas die. If he’s a slightly more determined entrepreneur, he might try to convince someone else to build it for him. Usually, he’s a great salesman or has a lot of money, sometimes both. But he doesn’t want to be tied down to his offshore developer forever, so this isn’t a viable option for him or the others who don’t have his consultant nest egg. After this is where the first seeds of self-empowerment are planted. 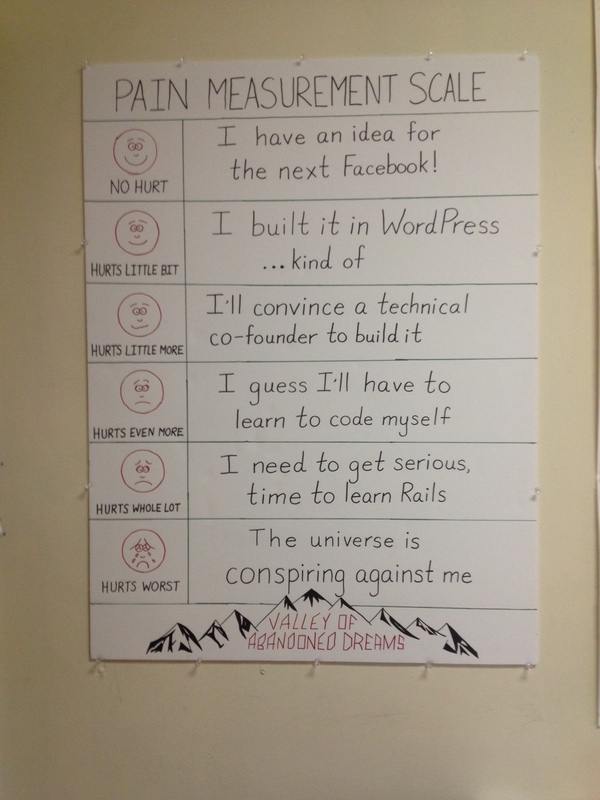 Fed up with feelings of helplessness, a tenacious entrepreneur will make his first forays into learning to code. To get his feet wet, he’ll try Codecademy. Maybe go on W3Schools. And he feels great! He’s writing gibberish and things are happening! He starts calling himself a coder. Months pass but nothing happens. He has no idea how to take the little HTML he’s learned and apply it to his idea. His friends start thinking of him as a wantrepreneur. He feels miserably incompetent but decides to make one last hurrah and learn to code for real – he takes on Python, PHP, or Ruby. This is the point at which our users find us–through a “deep google search” as one person put it. They’ve been put through the wringer and they’re tired. They’re impatient. They don’t give a damn about syntax or being a coder. They just want a working prototype of their idea that they can customize. Learning to build is very different than learning to code. But everyone still teaches it the same way. We get it because we are those entrepreneurs trying to bring our ideas to the web. It’s why we had the idea for BaseRails in the first place. We want to truly empower someone to feel that they can hack together something that works. Instead of focusing on the code, we focus on building with a combination of code, outside tools, and resources that are needed to get your app live. This is all just a roundabout way of saying that if you haven’t experienced the pain yet, if you’re not at least in the “hurts whole lot” category, we might not be the solution for you. Our most avid users, the ones who’ve gone through our course multiple times, they’ve felt the pain and they’re determined that this time will be different. With that said, by no means do we have the perfect solution. Through feedback from our early students, we think we’re on the right track with this whole practical, results-focused building thing. We’re also learning from you guys and if the story I outlined above sounds eerily familiar, please reach out and share your journey. We’re always brainstorming ways to make your life easier as an entrepreneur and hacker. Seriously, reach out. It makes us feel like we’re not the only Joe Schmoes out there who care about this stuff. Great post Susie. This is a real path of pain you have drawn. I´m planning to try your courses and build my old idea building your prototypes. Thanks a lot!